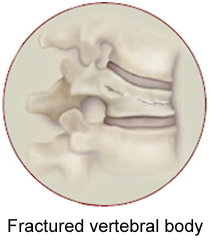 Kyphoplasty and vertebroplasty are procedures that aid in stabilizing spinal fractures. This stabilization will result in relief of fracture-induced pain. The procedures target the spine through a minimally invasive procedure rather than complete incision, but done with a local anesthesia and sedatives. What are the major indicators for having Vertebroplasty? Spinal fractures due to osteoporosis or cancer are the main reason why a patient may need to undergo a kyphoplasty or vertebroplasty. These fractures may cause pain and limited functionality. However, this procedure may only be recommended for specific patients and not for everyone. Failing to respond well with traditional fracture treatment such as with pain medications and bracing can make a patient a candidate for this procedure. Chronic pain accompanied by immobility is also a good reason for subjecting a patient to vertebroplasty. What does a Vertebroplasty or Kyphoplasty entail? Vertebroplasty and kyphoplasty are minimally invasive procedures that take about a half hour to complete. The patient at times receives general anesthesia, but may just receive sedation and local numbing. The procedure is performed under image guidance with fluoroscopy, with the Seattle pain management physician placing a bone needle into the fracture. 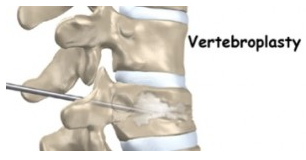 For a vertebroplasty, bone cement is immediately placed. With a kyphoplasty, a balloon is inflated into the space first. Once the balloon has cleared out an area of the fracture space, the balloon is deflated and removed. Bone cement is then placed under low pressure. What to expect when having a Kyphoplasty or Vertebroplasty? These procedures are minimally invasive, short, and often performed as an outpatient. Pain relief is often achieved immediately. It is possible for some muscle spasms to persist for a week or two after surgery, but this usually fades away nicely. Several studies have shown pain relief to be 80-90% from either procedure, and patients achieve an increased ability to walk. The incisions for the procedure are extremely small, usually a simple band-aid is all that is necessary. What are the risks of having a Vertebroplasty? There are minimal risks with these procedures. There is a slight risk of infection, bleeding, nerve injury or anesthesia complication. Rarely, cement can leak into areas where it shouldn’t be such as around the spinal cord. Since the bone cement heats up very high as it dries, this may cause significant neurologic injury. What are the benefits of having a Kyphoplasty or Vertebroplasty? Vertebroplasty’s benefits include decreasing pain and increasing function. This has over an 85-90% effectiveness, and should be considered as a “go to” procedure for patient benefit. Seattle Pain Relief offers kyhoplasty and vertebroplasty with success rates that exceed 85%. Most insurance is accepted. Simply fill out the form on the page or call (206) 536-3007 today!